The Zesty.io office in downtown San Diego. At the dawn on the digital age, it was enough to have a website. Now even medium-sized companies have multiple websites and a wide range of mobile offerings. 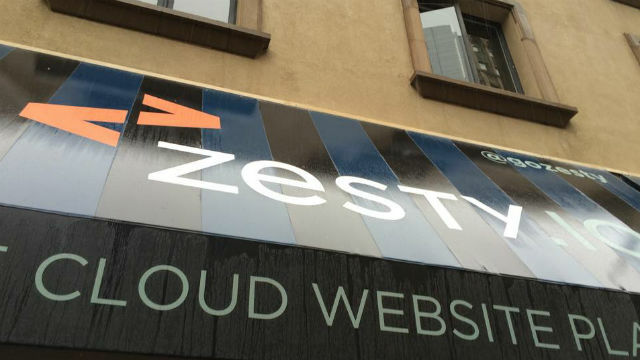 Zesty.io‘s team has developed an innovative, cloud-based content-management system that help enterprises rapidly and securely deploy high-impact websites. The four-year-old startup is winning contracts from major companines like Sony. Times of San Diego spoke with founders Randy Apuzzo and Andy Fleming about their company. Why did you start Zesty.io? We developed the first version of Zesty.io in 2010 to address the difficulties experienced by companies deploying website content at scale. The product evolved into a full platform in 2013 and has gained steady acceptance as a full-featured, 100 percent software-as-service content-management platform. Zesty.io empowers marketing teams to deploy website content rapidly while ensuring low-cost and high impact results. Both of us had felt the pains of the website development industry. When we met in San Diego in 2010, we realized that we could bring our knowledge of design and programming to solve this problem. Working in the basement of Randy’s Little Italy loft, we put all of our free time into developing a system to manage multiple sites. 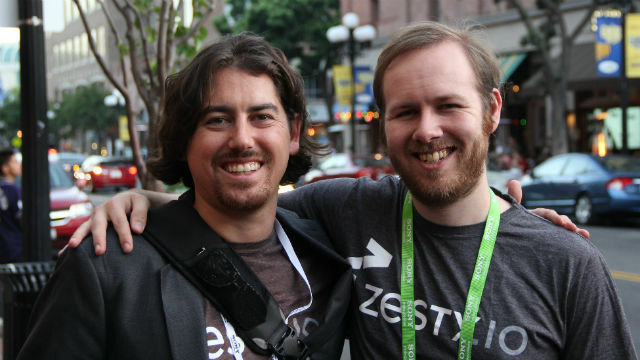 When Zesty.io was complete, we joined forces, started building a team, and looked to San Diego angel investors to help launch sales and marketing efforts. The Zesty.io platform makes use of “satellite sites.” How do they work? Zesty.io satellites are websites geared for our very digital future, in which companies have not one but multiple web properties used to reach different audiences, using different channels. A primary corporate website can be a separate satellite from a company’s microsite targeting a specific product category; a division of the company could have their own satellite, and so on. These satellites can all be managed centrally on the Zesty.io platform, creating greater content organization and targeting opportunities while streamlining content management. Content managed within a Zesty.io Satellite is also omni-channel and completely mobile responsive, meaning that it can be delivered to multiple devices with different screen sizes and display optimally from one central source. Lets use Times of San Diego as a real world example of distributing content to different channels. Currently, when Times publishes a new article, it shows up on the website, a single digital instance. If Times had an Android App and Apple iOS app and was using a satellite, a single update to content would update three digital instances — a website and two mobile applications. Each satellite instance that a company develops and deploys on the Zesty.io platform is a modern, load-balanced website that can be accessed by desktop, mobile, and other device browsers, whose content can also be delivered to any device connected to the internet. This happens through a content application-programming interface, or API. You focus on mid-market companies. Why that market segment? Zesty.io solves a lot of problems that marketing teams face in larger organizations. Larger companies have security and scaling needs that the Zesty.io platform satisfies way beyond what a do-it-yourself or open source content-management system can offer. Zesty.io, as a software-as-service product, offers integration with leading tools that mid-market to enterprise-level businesses can leverage on a day-to-day basis to increase their business efficiency and competitive advantage. 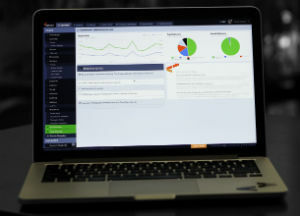 Examples of these third-party tools include Salesforce, Marketo, and Exacttarget. Is Zesty.io a product for everyone? Zesty.io is not for every company. If a company is relatively small and does not have the need to manage larger volumes of content or multiple web properties, it could get away with using a do-it-yourself product like Squarespace or Wix, or an open source content-management-system like WordPress. Larger companies or growing companies would benefit from building websites, microsites, landing pages and apps on Zesty.io and matching them with Salesforce customer-relationship management and Marketo marketing automation. Sony is now a customer. Who are some of your other customers and why did they choose Zesty.io? At the moment, our primary customers are digital agencies who develop solutions for their own clients. One local San Diego agency, Experiences for Mankind, has been using Zesty.io since 2014. They have designed multiple brand sites using our platform, including sites for Sony, Biofilm, and AXmentor. To highlight one of their clients, Biofilm is a global distribution product company and has many needs for internationalization as well as rapid marketing deployment. Zesty.io allows Experiences for Mankind and Biofilm to work collaboratively on the platform. EFM drives marketing campaign structure and creative, while their clients contribute new marketing content. Working together on a central platform allows both agencies and their clients to respond very quickly and collaboratively to marketing opportunities. Zesty.io was chosen as a modern, agile marketing platform that supports collaboration and rapid site development and deployment. Another example is Mission Brewery, which has been using Zesty.io since 2013. Their website features custom content areas for different focus areas of their business. Zesty.io’s content management interface allows them to edit what’s on tap, brewer information, awards they’ve won, and news articles. Web technologies change very quickly and we are able to keep Zesty.io on the cutting edge of features, capabilities and performance. Mission Brewery has been through three site redesigns on Zesty.io without having to reinvent the wheel or re-enter their content. Zesty.io is chosen because a client can focus completely on their creative, their content and their marketing goals instead of spending time maintaining and troubleshooting hardware and connectivity infrastructure.